We believe Agent's data is their own and we will always allow agents to take their client database with them. We will never contact Agent's clients without their explicit permission. We’ve built the first modern real estate platform, pairing top talent with technology to make the search and sell experience intelligent and seamless. Called the Pinterest of real estate, this curated visual workspace allows agents and clients to collaborate in real time. You can easily organize homes, centralize your discussions, and monitor the market by receiving immediate status and price updates. Save homes that match your clients’ criteria on an interactive board with photos and listing information. Invite buyers—as well as spouses, parents, and friends—to view a collection and add properties they like. Comment on properties and answer questions with simple and centralized communications. Receive automated and immediate price and status updates for all the homes in your collections. This personalized dashboard contains all the key data points you need to craft a winning marketing strategy around audience and traffic information, uncover new lead-generation opportunities, and invest accordingly in the positioning of your listing. Use real-time engagement and traffic insights to endorse your recommendations to clients, including tricky price drop conversations. Gain actionable insights from your dashboard at a glance, and share reports that show all the ways you’re driving traffic to your clients’ listings. Learn about your listings' viewers and find out how your social media and digital advertising channels are performing so you can build an informed marketing plan. Our digital design studio features a library of sophisticated designs so that Compass agents can effortlessly customize beautiful print and social collateral with just a few clicks. Marketing Center integrates with Compass.com, so listing and contact information automatically pre-populates in your design. Edit text, drag-and-drop images, and change layouts to customize each piece to suit your needs. Our in-house creative team designs beautiful marketing pieces that you can customize and share across multiple platforms. Compass Markets for iOS is the first mobile app that puts real-time residential real estate data at your fingertips. Instantly access the most recent transaction data as well as historic sales trends. With up-to-date data on neighborhood listings, easily answer clients' questions and provide them with helpful information no matter where you are. Share neighborhood market trends with clients to support your suggestions like valuations and price drops. Compass CRM is a customer relationship management platform that empowers agents to nurture relationships, close more sales, and stay one step ahead with insights powered by artificial intelligence. Try our technology for yourself. Your guide to finding a home you’ll love, Compass Real Estate combines best-in-class technology with exceptional real estate agents to make your search for homes smart and seamless. With Compass Markets, homeowners and agents can build market-specific reports and get real-time information on the go to provide answers to real estate's most difficult questions. Our digital questionnaire invites agents to take an active role in the creation of their custom logo. A series of fast, fun prompts provides our designers with all of the information they need to develop an impactful, personalized design. Using the Compass Real Estate app, our agents can program this proprietary smart sign from the palm of their hand. The ultimate transaction resource, it allows all who encounter it to access property images and neighborhood details via a QR code, and in turn relays invaluable insights regarding prospective buyers to the agent and their seller. Our dynamic videos are designed to elicit and broadcast the best of each listing and allow prospective buyers an unprecedented glimpse of each property. We’re making an impact from coast to coast. Serving vibrant real estate markets nationwide, Compass agents and teams pair data, technology, and design with unparalleled local knowledge. We're a real estate company with a purpose, and our mission is to help everyone find their place in the world. Discover the shared purpose that drives our team. The compass entrepreneurial principles embody your values and define our culture. Our CEO Robert Reffkin tells the story of how he overcome a difficult childhood to find his own place in the world — and how that informed his vision for Compass. Listen to Robert Reffkin’s vision. As a company dedicated to helping everyone find their place in the world, serving our communities is central to our msision. Watch Robert Reffkin pledge $10M in 2019 in charitable donations through our new Compass Cares initiative. What is your email and phone number? 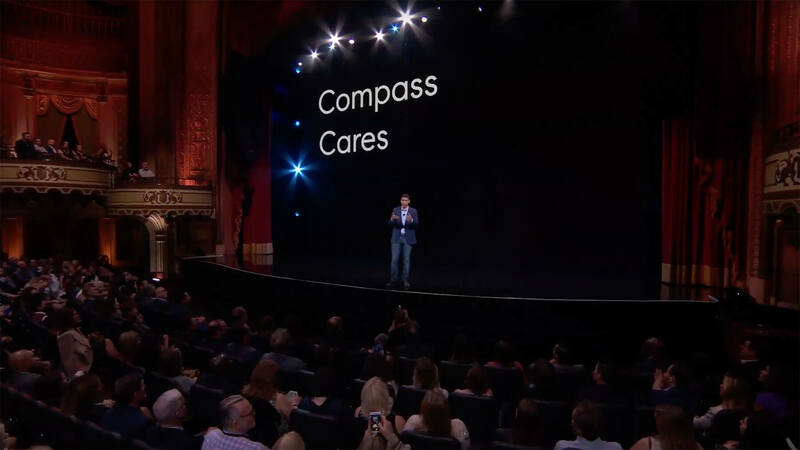 Thank you for your interest in Compass! A member of our team will be in touch soon to schedule a discrete and confidential conversation. Looking to apply for a employee job at Compass?